STEP 2: Select what is applicable for you below. Pay online using your Paypal or credit card, or via BDO bank deposit. 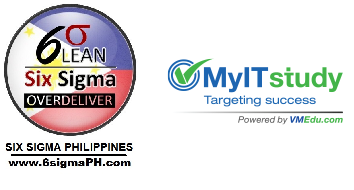 * If your company is 0%VAT, NON VAT or VAT Exempt, please e-mail us PEZA Certification, or other equivalent government issued document, to ask@6sigmaph.com. *Official Receipt to be sent via registered mail. Please give 1-3 days maximum for us to process your account (usually takes only within few hours). E-Learning account details to be sent to the e-mail address on the online registration form. The ITIL® Foundation is an online program in which delegates will gain a comprehensive grounding in the aspects of ITIL® service management. This course leads to the ITIL® Foundation level certification. Delegates are prepared for the Foundation examination. The Foundation qualification is a pre-requisite for the ITIL Intermediate examinations. PrerequisitesThere are no pre-requisites for this course, nor is there any pre-course preparation required.